You recently received a Guitar Hero III Legends of Rock Wii replacement disc. 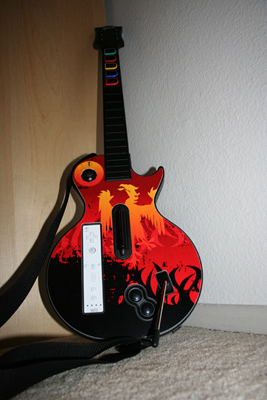 To show our appreciation for your patience during the re-mastering and manufacturing phase of Guitar Hero® III: Legends of Rock for the Wii, enclosed is a complementary Guitar HeroTM faceplate from Activision/RedOctane. If you have any questions or need any additional support regarding the re-mastered Wii disc, please don't hesitate to contact Activision Customer Support at www.activision.com/support. Once again, thank you for supporting Guitar Hero.